Pendine was a manor of the post-Conquest Lordship of Laugharne, held of the de Brian lords from the 13th century; the village itself lies in Area 147. On the tithe survey of c. 1842 (Pendine tithe map) a small settlement of four houses and a lime kiln is shown on the shoreline, hard against the foot of a steep slope, with a cluster of houses further up the hillside at New Inn. At Llanmiloe to the east stood Westmead Mansion in its grounds, and Llanmiloe House (Laugharne Parish tithe map). The former holding was owned by John Perrot, Lord of Laugharne, in the 16th century but the present house was built by sir Sackville Crow in the 17th century (Lloyd 1986, 56). The latter dates to the 1720s and was acquired for military use during the Second World War when a Ministry of Defence research establishment was set up on the marsh to the south. A tourist industry developed at Pendine during the latter part of the 19th century and the 20th century. At first development was low-key, consisting of the construction of villas, a public house and a small hotel. However, since the Second World War Pendine and Llanmiloe have experienced large-scale changes with the building of extensive holiday and caravan parks, and the foundation of a Ministry of Defence research establishment, worker housing for the latter in the form of small estates including 'prefabs' - now rare survivors of post-war social housing - and more recent brick and concrete dwellings. A narrow band of land from Llanmiloe to Pendine is now continuously developed with housing, shops and caravan/holiday parks. 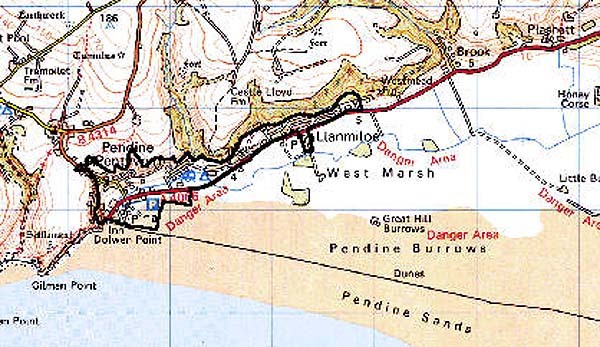 This area occupies the coastal fringe at Pendine and comprises former reclaimed marsh, sand dune, and the lower built-up hillside of the coastal slope lying between 5 m and c.30 m above sea level. 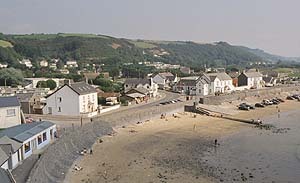 Apart from Llanmiloe House, the earliest surviving development consists of cottages, a hotel and public house, and 19th century villas on the sea front and coastal slopes. This early development has been swamped however by caravan/holiday parks on the reclaimed marsh at Pendine, and by housing development at Llanmiloe for workers at the nearby Ministry of Defence research establishment. Included in this housing is a small estate of post-war 'prefabs'. Most of the housing is of a more recent date. The Museum of Speed, celebrating the attempts on the land-speed record on Pendine sands in the 1920s, has recently been established on the sea front. Recorded archaeology is restricted to the Post-Medieval-modern sea defences at Pendine. Buildings are all stone-built with slate roofs. Llanmiloe House is an imposing structure of several periods, but the central block is probably from the 1720s; the well-preserved Edwardian garden, mainly from 1908-12, is entered as ref. number PGW (Dy) 1 (CAM) in the Cadw/ICOMOS Register of Parks and Gardens of Special Historic Interest in Wales (Whittle, 1999). The Pendine and Llanmiloe historic landscape character area is contained and therefore well defined. It stands is sharp contrast to the steep, wooded coastal slope and enclosed farmland to the north, and sand dunes and reclaimed marsh to the south.